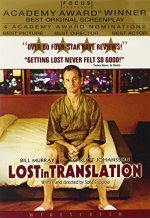 Lost in Translation release date was Friday, September 19, 2003. The second feature film from writer-director Sofia Coppola ("The Virgin Suicides") is set in Tokyo, where two bored Americans — a fading TV star (Bill Murray) shooting an alcohol ad and a young married woman (Scarlett Johansson) with an ambitious, neglectful husband — become fast friends after meeting in a hotel bar. The two then spend an adventure-filled weekend together "finding themselves."